Optimum Nutrition Opti-Men Review – Should you take it? Multivitamins have become a part of our daily ritual. It is estimated that half of Americans take multivitamins regularly. In fact, multivitamins are the most popular supplements in the United States. But if you ask a random person about their multivitamin habit, many would say that they take multivitamins to stay healthy and make up for poor eating choices. Optimum Nutrition Opti-Men is a multivitamin that promises to give you 100% of your recommended daily allowance of the key nutrients that your body needs. It claims that it contains 75 different ingredients packed in a single pill. Much like how Centrum is marketed, Optimum Nutrition Opti-Men claims that it has a complete formula to give users exactly what their body needs. Multivitamins do not guarantee that you get 100% of your recommended daily allowance (RDA). Multivitamins like Optimum Nutrition Opti-Men are formulated to consider your regular diet in conjunction with the multivitamin’s ingredients. However, multivitamins are an excellent choice for people who have a fixed diet like vegetarians to help supplement their lack of nutrients due to their diet choices. Who uses Optimum Nutrition Opti-Men? Optimum Nutrition is a well-known brand in supplements. Typically, Optimum Nutrition Opti-Men is sold as a bundle with other products marketed by Optimum Nutrition. Outside of the bundle, some buy Optimum Nutrition Opti-Men as their daily supplement to help them get 100% of their RDA. We studied the contents of Optimum Nutrition Opti-Men to determine if it really has what it takes to be the best multivitamin available today. According to Optimum Nutrition, Opti-Men is the daily multivitamin for Active Men to Optimize Everything. 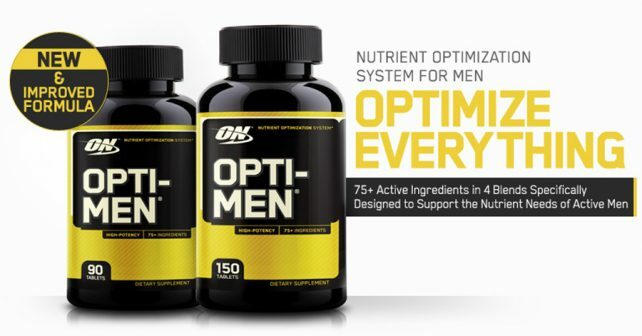 Optimum Nutrition Opti-Men supposedly has 75+ active ingredients, loaded with vitamins and minerals. Optimum Nutrition Opti-Men is also loaded with more vitamin D, 275mg of B-complex vitamins, and 1,000mg of amino acids. Optimum Nutrition Opti-Men splits its ingredients into 4-major parts: Amino-blend, Viri-blend, Phyto-blend, and EnzyME-Blend. Optimum Nutrition Opti-Men comes in an easy-to-swallow pill, which is a great help especially for older men. Its Amino Blend includes miniscule amounts of Arginine, Glutamine, and BCAAs, which are popular ingredients in muscle-building supplements. Its Viri-blend consists of ingredients that you would typically see in male enhancement supplements like Saw palmetto and ginkgo biloba. Like its amino blend, it only contains small amounts of these ingredients. Its phyto blend consists of a long list of plant powders which are crammed into a 100-mg blend. Lastly, its EnzyME-blend is composed of 4 digestive enzymes that help with digestion. On paper, Optimum Nutrition Opti-Men may appear to be an excellent multivitamin, but with all of these ingredients, you can’t help but wonder how they were able to cram everything in just one easy to swallow pill. Just like its phyto blend which includes over 15 different ingredients in a miniscule 100mg dose – just one fifth of your typical Acetaminophen dose. If you’re looking for the best multivitamin available, check out Ultimate Man Once A Day. It gives you the best balanced formula optimized for the daily nutritional needs of men. Check it out today.